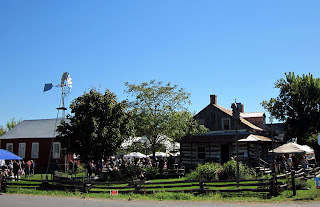 One of the best things about this time of year is going to the annual Fall Festival in Dunvegan Ontario. 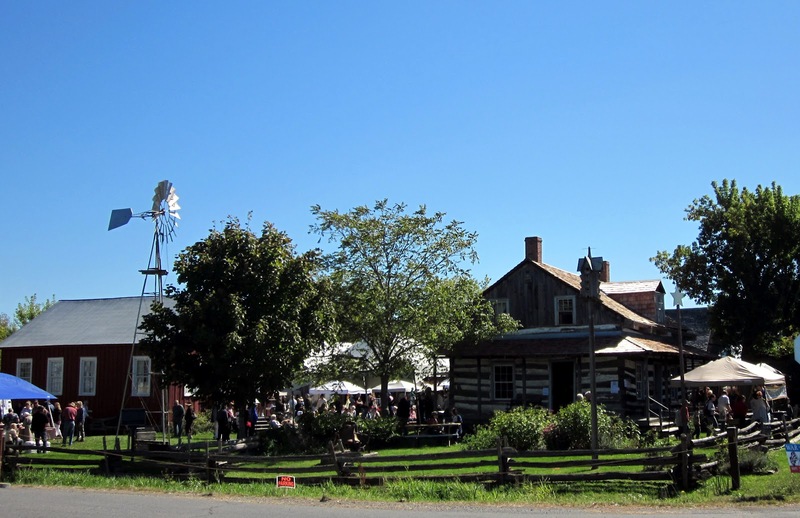 The festival is held on the grounds of the museum at the crossroads in the village. There were lots of people who had come to see the displays, visit, chat, have a good time. The highlight of the day was the horse parade (more on that tomorrow). There were plenty of animals, like these sheep, that were later part of a sheep-sheering demonstration. Many of the people at the Festival were wearing period costumes. There was a town crier to announce the various events during the day. There were many antique machines on display, like this amazing steam engine that was actually working - it was used to power an antique wheat thrasher. And of course, there were many horses. This one was huge and we were all wondering how its owner (in the pink dress) would be able to climb up to ride him. One man beside me suggested she would need a ladder! Musicians were performing all day. This group was terrific - playing some real old-time music. The guy on the fiddle was fabulous. Happy I bumped into you there. What fun! I love that my godson and his Maman are behind me in the photo. Wasn't that a fun time?